Last week I joined millions of Americans cheering Michael Phelps on to his record breaking 19th Olympic medal though he couldn’t hear a word I said to my television screen. Maybe someday my household TV will have that kind of technology. Won’t that be interesting. I might change what I say to the TV if I can be heard on the other side. But that is a post for another day. Today we concentrate on the race. The best Olympic athlete of all-time finished his games with 22 medals. A grand feat to be sure. Of course there are naysayers and those with a grudge, but any realistic observation of Michael Phelps’ Olympic tenure has to conclude he is the best and finished his racing career extremely well. I do have a respectful awe for this man and his accomplishments, but more so of the tenacity and commitment over the 16 years of his Olympic career. Sure he had the few years he slacked off, which he readily admits. But overall he stayed the course and met his goals. He completed 24 Olympic races and received medals in 22. Not too shabby. But what I am really impressed with is that, as far as I know, every swimmer who started a race in the London Olympic pool, finished the race. From the person who came in with the slowest time in a preliminary heat to the last gold medal win from the US medley team, each swimmer finished his or her race. And we expected them to do just that. Just imagine our reaction to a swimmer who would stop swimming when they got to the other end of the blocks and simply got out of the pool or if they decided to float on their back to finish the last 50 meters. We would wonder if they were hurt of sick. But if these were not the issues and they just decided not to finish because they had no hopes of beating Phelps, or Soni, or Franklin we would be appalled, would we not? The same can be said for the track and field events. I’m sitting here watching the men’s preliminary hurdles. One racer pulled up right out of the blocks and did not finish the race, but I am not appalled. Why? Because he pulled a hamstring and couldn’t physically continue. All the other racers finished and gave all they had; even the guy who came in last. To me that is impressive! Think about it. Athletes like Michael Phelps are seasoned well-trained competitors. You might even say they are used to winning on the world stage. Of course they have to deal with nerves and personal demons, but thousands of hours of training in the pool and hundreds of races have equipped them to be steady and confident. So how does the guy who has no hope of beating a Phelps or Lochte or le Clos get on the block, dive into the water and swim his heart out to earn “dead last?” He does it with courage, maybe even more courage than the most decorated Olympian of all time. 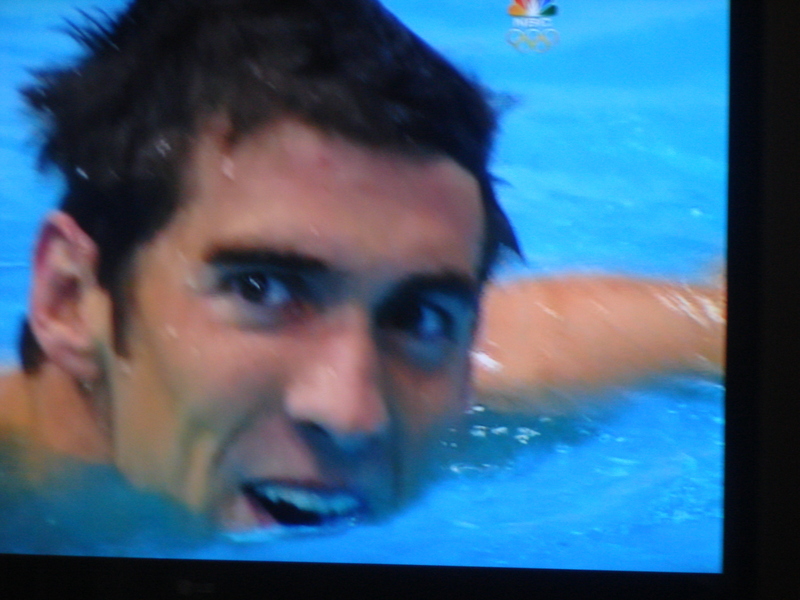 He does it by concentrating on his race, his goals, his time; not Phelps. He doesn’t look down at Michael in lane #4 from his lane #8. He focuses on his lane. When the starting gun fires he won’t tilt his head to see if Michael hits the water before he does. He moves his own body off the block and keeps his eyes fixed on his own lane. And as he hears the crowd roar with cheers and applause while he still has 20 meters to go, he continues to push through strong strokes hoping to beat his own best time. Often he does because after all this is the Olympics and he is determined to do his best in his own race. There can only be one gold, one silver and one bronze medal awarded per event. But everyone can finish their race/event. As writer’s we need to develop that kind of tenacity, determination and courage. We may never sell as many books as Karen Kingsbury or be as famous as Beth Moore, but we don’t need to. What we do need to do is finish our race. We need to stay in our own lane (path) and focus on our vision and the goals God has laid out before us. Do you have a manuscript to finish? Stop brooding over another writer friend signing yet another book deal and complete one more chapter in your book. Do you have a writing assignment due in a few days? Quit looking over at your mentor’s lane full of article credits. Keep your head down over the keyboard and get the assignment done and on time. Personally, I have the hardest time finishing various writing races God places me in because I expend a great deal of energy worrying about and comparing myself with the other writers around me. If I would just channel all that energy to my race, I know I would be so much farther along in my writing race. 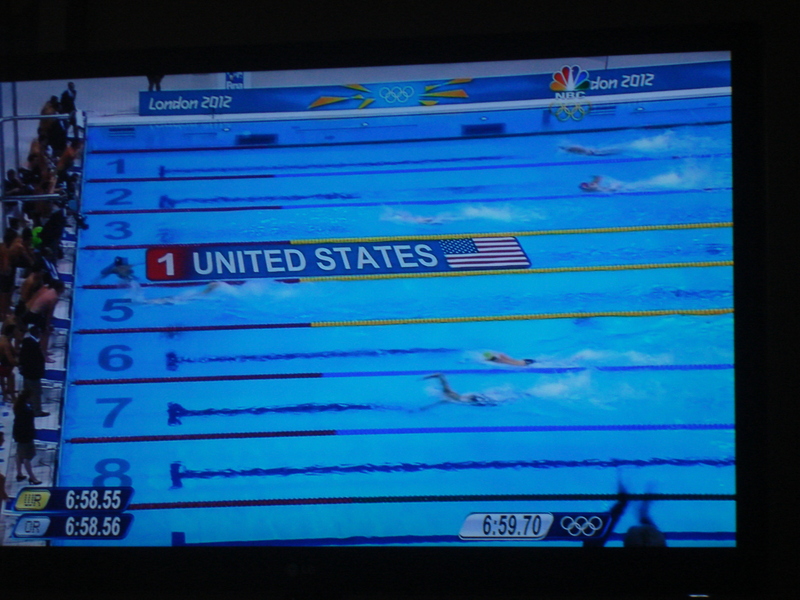 I want to keep this picture of Michael Phelps’ 19th medal race in my mind. Not because of Michael’s win as exciting as that was, but because of the other seven who gave their all and finished their own race. What are your struggles in finishing your race? How do you overcome them?